Looking for a New Volkswagen GTI in your area? CarGurus has 670 nationwide Volkswagen GTI dealers with 7,932 new car listings. With its 2018 GTI, Volkswagen continues to perfect the daily-driven hot-hatch. Driving a performance car has its setbacks. The ride is typically harsh, fuel economy suffers, and it's seldom usable by more than two people at a time. Therein lies the brilliance of a hot hatch, like the 2018 Volkswagen GTI. It blends sporty characteristics with real-world practicality. The hot-hatch formula is relatively simple: Take a sensible hatchback, give it a more powerful engine, tighter steering, stiffer springs, and various aerodynamic bits, and boom! You’ve got a sports car that can actually fit family members and co-workers or provide usable cargo space. The concept of the “hot hatch” dates back to the original MINI Cooper in 1959, but the car that made it a “thing” was the Volkswagen GTI, starting in 1976. There have been rivals and sportier cars through the years, but the GTI is the car that made the hot hatch popular. In recent years, the segment has experienced a renaissance and more broadly, compact performance cars like Honda Civic Si, Subaru WRX, and Ford Focus ST have joined the fray. Does the Volkswagen GTI still have what it takes to battle this growing crop of usurpers? Read on to find out. Visually, the GTI can stand out in a crowd. While the GTI’s more powerful stablemate, the Golf R, is something of a sleeper with subdued styling, the GTI wears its performance pedigree proudly. 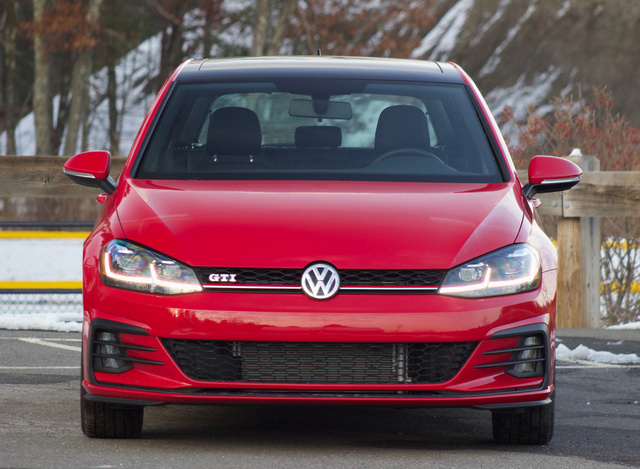 The GTI visually separates itself from the rest of the Golf lineup with a more aggressive lower front valance. A honeycomb grille pattern is found below the bumper and flanked by heavily stylized fog-light frames. The upper grille also features a honeycomb pattern and GTI lettering. It's flanked by upgraded headlights, which feature a red character line, extending from within the headlight housing out to the grille. 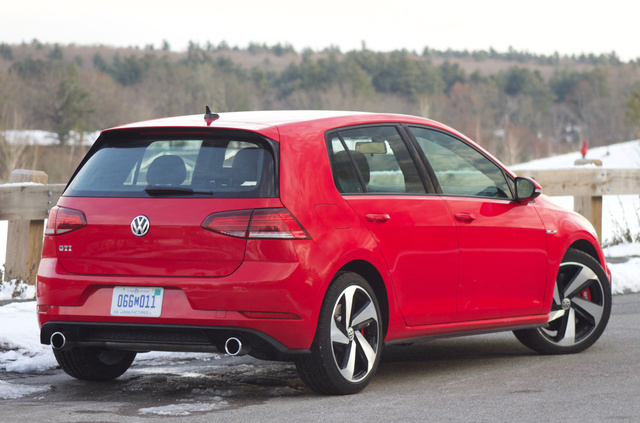 The back and sides of the GTI feature added side skirts, while the subtle integrated exhaust outlets are exchanged for a pronounced dual exhaust. 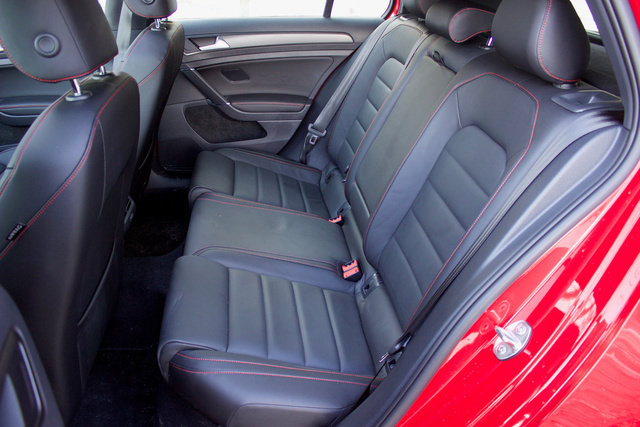 Inside the GTI, the fit and finish easily surpass the competition's. There's a blend of hard plastics and soft-touch surfaces, but it's mostly the latter. From a feel, look, and function standpoint, the cabin of the GTI is miles ahead of the cabins in the Ford Focus and Subaru WRX. Both of those rival vehicles are heavy with hard, cheap plastics. Compared to these two vehicles, the GTI is the adult in the room. The 2018 GTI comes in three trims: S, SE, and Autobahn. S trims come standard with 18-inch performance tires, heated side mirrors, a leather-wrapped steering wheel, heated front seats, a 6-and-a-half-inch touchscreen, Bluetooth connectivity, and awesome-looking red LED accent lighting. The SE adds a sunroof as well as LED headlights with helpful cornering lamps. It also adds keyless entry with push-button start and a larger 8-inch infotainment screen. The range-topping trim is the Autobahn. It has everything from the S and the SE, and it adds automatic climate control, a 12-way power driver’s seat with lumbar support, auto-dimming rear-view mirror, navigation, and a Fender premium stereo system. 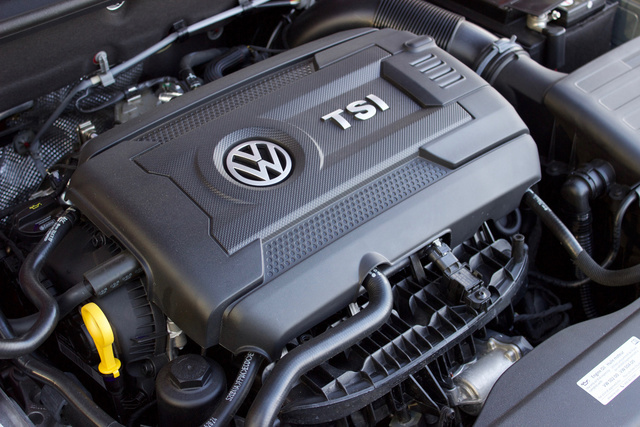 The GTI is powered by a 2.0-liter turbocharged inline 4-cylinder engine. It makes 220 horsepower and 258 pound-feet of torque. Output is actually up from the 2017's 210 horsepower. In ’17, you could still get 220 horses in a GTI, but only if you opted for the Sport trim (or VW’s Performance Pack before that). The added power now comes standard, and just as importantly, the engine makes a wonderfully devious rumble. The GTI’s engine routes power through a 6-speed manual transmission or an automatic, 6-speed Direct-Shift Gearbox with front-wheel drive. The DSG, as it’s called, features a tap-shift manual mode and is great for sitting in traffic or focusing on your ideal line on a track. But the true manual transmission, like in our test model, is nearly perfect. Shift throws are a bit longer than that of the Mazda Miata, which many cite as the Gold Standard manual. But the precision of this shifter is nothing short of fantastic. At first, I found the gearing on the GTI “tall.” This means that where I might typically shift from second to third at 30 mpg, I was doing it at 35 or even 40 mph in the GTI. But as I started to push it and give it a more spirited drive, the taller gearing made perfect sense; with 258 pound-feet of torque, you have a broad torque curve or power band. I could leave the GTI in third when pushing through certain segments of back road that would have required an extra up- or downshift in, say a Miata. This allows you to think less about shifting and focus more on hitting the perfect line on a back road. The steering felt a little light at first, but one press of the Drive Mode selector fixed that. The Drive Mode selector lets you choose Eco, Normal, Sport, or Custom presets. This changes the throttle response and steering feel instantly, and Sport mode tightens up the steering. The result is a car that goes from comfy to lively with the push of a button. Cornering feel is reminiscent of that of another compact performance car, the Honda Civic Si. Both vehicles are capable of being comfortable when both sitting in traffic and driving with spirit on winding roads. 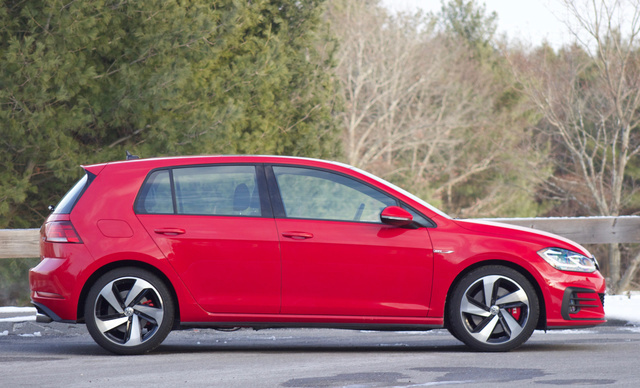 If you opt for the SE or Autobahn trim, the GTI benefits from the larger brakes of the weapons-grade Volkswagen Golf R—crucial for bleeding off speed when coming to a quick stop or entering a corner at high speed. SE and Autobahn trims also come standard with an electronically controlled limited-slip differential. If you are looking into performance cars, you might come across this term, so what does it do? The differential can apply power to only one wheel when it senses the other wheel slipping. But in performance driving (especially in racing), losing power from one wheel means losing speed—you want to be putting power to both wheels as much as possible. So a limited-slip differential puts a limited amount of power to both wheels, so you can gain traction without losing speed. Fuel economy for the DSG-equipped GTI is 24 mpg city, 32 highway, 27 combined. With the 6-speed manual, fuel economy improves to 25, 33, 28. In our week of combined city and highway driving, we observed fuel economy of 26.8 mpg. The driver’s seat of the GTI is comfortable, but pretty heavily bolstered—far more than a typical Golf’s driver’s seat. This is to keep you firmly in place during hard cornering, but if you are large, it could feel like sitting in a vice. Once you get situated, the GTI’s seats will be fine, even on long drives—it’s just getting into that ideal position that will be the challenge. The front seats slide quite far back, providing plenty of legroom for front-seat passengers. This, obviously, comes at the expense of rear-seat passengers. Once a front-row occupant has gotten comfortable, there's not much space left for the rear seat. Even if you slide far enough up for adequate rear-seat legroom, the front seats are then cramped. On the plus side, the upright layout of the GTI provides plenty of headroom. Moving back up front, climate controls use simple dials, which is how things should be. Too often, automakers try to employ some unique control layout, and the car is worse off for it. Automakers that do anything other than this are making things more complicated than they need to be. Volkswagen has established itself as one of the leaders in the automotive space by keeping things wonderfully simple. The standard seats have a combination of manual slide and height adjustment, but power seatback adjustment. That is a weird combination, since, if you find the power seatback adjuster first, you’ll likely search the rest of the seat for the other power adjustments. Or if you find the manual adjustments first, you might be surprised by the power seatback adjuster. It is a rather awkward combination of controls. As it is based on the Volkswagen Golf, the GTI boasts 23 cubic feet of cargo space in the rear of the car, and 53 cubic feet when you drop the 60/40 split-fold rear seats. The car offers a wealth of little storage solutions throughout the car, from a storage bin near the steering wheel to the center-console bin and the center stack tray. Overall cargo space is better than in the Ford Focus ST, which provides up to 44.8 cubic feet. The Focus also suffers from an awkward trunk opening, thanks to its taillights jutting out. 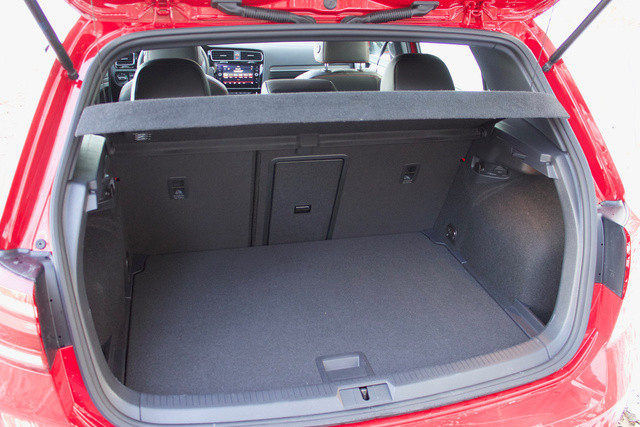 The more traditional design of the GTI provides better access to its cargo space. The base infotainment system is a 6.5-inch touchscreen complemented by a standard USB port, Bluetooth connectivity, 8 speakers, and VW Car-Net App-Connect. 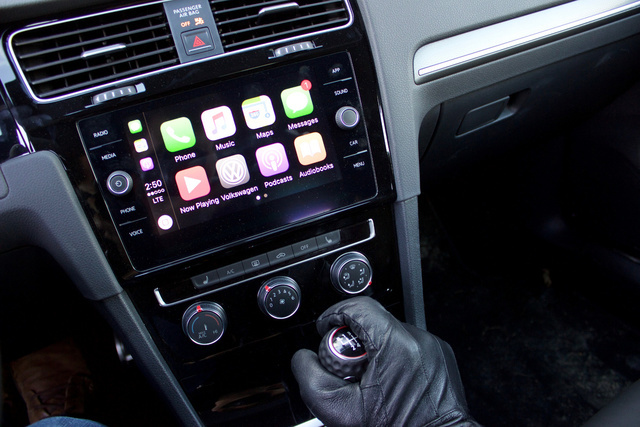 This system includes Apple CarPlay and Android Auto, enabling you to use your smartphone for music, podcasts, sending and receiving texts via voice prompts, and its native maps application. The SE and Autobahn come with a new 8-inch touchscreen display that is easy to use and, as in previous years, has a sensor in the dash that brings up controls as your hand rises to the screen. But the big problem with this new system is that it is flanked by a bezel with new touch-capacitive buttons. If you try to use a touchscreen when driving, there's a tendency to brace your hand on the area around the screen, so your hand won’t be shaking when you attempt to touch the screen. Touch-capacitive controls are very sensitive, and you can accidentally hit buttons you didn’t mean to press. I’ve noticed that when I tried to change the channel via the tuning dial, I accidentally hit vehicle settings, and rather than changing the channel, I was adjusting some random vehicle setting. Perhaps the worst part of this new button layout is that the buttons do not respond well when trying to operate them while wearing gloves. This is a major issue if you live anywhere that gets remotely cold in the winter, as it forces drivers to decide between wearing gloves or operating the radio when the temperature drops. What’s too bad about all of this is that Volkswagen has been very good at audio and infotainment controls for a very long time. Standard safety features include a full array of front and side impact airbags, reversing camera, hill-hold function, and electronic stability control. Opting for an SE or Autobahn trim adds blind-spot detection and forward-collision warning and avoidance with pedestrian detection. According to Volkswagen, the pedestrian detection is a late-availability feature and won’t come on the early SE models. So if you want this feature, please check window stickers to ensure the car you're looking at has it. Of course, if you get the Autobahn, you won’t have to worry about the availability of blind-spot monitoring. It also comes with adaptive cruise control. The 2018 Volkswagen GTI has a base MSRP of $26,415. The mid-range SE starts at $30,470, while the top-tier Autobahn trim has a starting price of $35,070. We drove the SE with the available leather seating, a $695 option, bringing the price to $31,165. The SE trim has all the features we could want, but we’d pass on the leather option in favor of the awesome-looking plaid seats that come standard on the S and SE trims. Take this car in the context of the Golf R, which makes 72 more horsepower and has all-wheel drive (AWD). 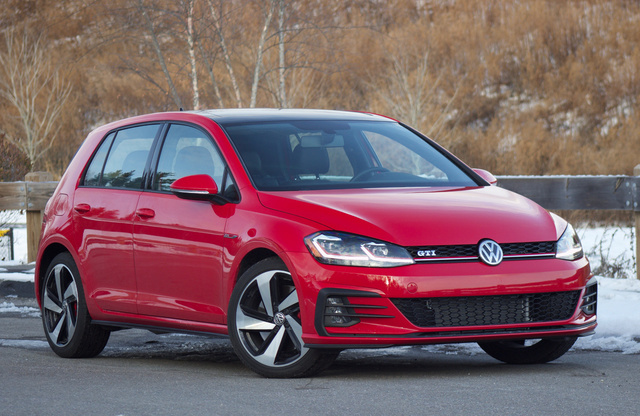 Because of these added features, the Golf R is faster, but it's also more expensive, costing between $35,000 and $40,000. That’s a lot to pay for a hatchback, and you might go for an Audi RS3 at that point. The GTI is an incredible value because it gives you that sporty driving experience for much less. Additionally, while the Golf R is absolutely fast, it feels a bit less connected. The GTI provides plenty of steering feedback and communicates the car and the road to the driver. In this modern era of electronic steering, few cars are capable of doing this as well. And the fact that such a car is also supremely versatile and practical makes the GTI the perfect sporty daily driver. What's your take on the 2018 Volkswagen GTI? GuruXR8L7 I love it. I bought one. Have you driven a 2018 Volkswagen GTI? Enter your zip to see incentives for a new GTI in your area. Looking for a Used GTI in your area? CarGurus has 5,261 nationwide GTI listings starting at $1,299.